To give you context, I am coming off of an intense few weeks of facilitating workshops on Biracial Identity and, as typically happens, after each session there is a small contingent of people wanting to connect. 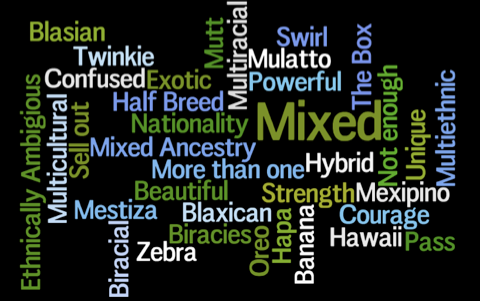 Some share their excitement about finally having space dedicated to Mixed Identity. For others, well we simply sit together as they work through their tears of deep pain. After this happened for the third time in less than two weeks, I was quickly reminded that most of our communities, including those on campus, are failing people of Mixed Race Heritage. At best, we are not effectively supporting students (staff and faculty) that identify as Multiracial and at worse, we are causing further trauma. Add Multiracial/ethnic Identity to the race conversation when most of the time we struggle just talking about and dealing with race at the monoracial level. You have probably noticed that I use different language in reference to this racial identity. Some may find this confusing or ineffective but I believe it a beautiful nuance in the race conversation. These various identifiers create space for fluidity and difference, and depending on the person and their context, it is critical to do so within our language while knowing it may not fit for someone. It is the quintessential skill of being able to hold multiple truths. Even in figuring out a title, I wanted to be inclusive and not be “that” person whom may trigger someone. I had to get over my fear about messing up and went with what resonated for me in my racial identity. I also want to be real about language that exists for Mixed Race Identity, that which is descriptive, connecting and liberating and that which is hurtful, confusing and excluding. When I use the image below during workshops, there is always a range of reactions. Some gasp, some laugh, some sit in silence, some nod their heads and others give me a glaring death look. Ultimately, we move to a rich conversation of thoughts and feelings about the terms, the image and their reactions. For participants that identify as Multiracial, there is an unexplainable connection of joy, pain, validity and community. On the other hand, monoracial participants often remark about not knowing some of the language or the meaning behind the terms while others remark about being called the same thing. I caution the latter and will explain why later in this post. Please take a few moments to simply take the in the image and reflect on your reaction – from a head space and a heart space. What terms have you heard, used or thought? What meaning do you make from the terms? What would you add to the list? It’s coming out to strangers, and friends, and lovers on the off chance that you might convince them that race isn’t one size fits all…It’s coming out so that interracial couples don’t have to fear the America their future children will grow up in…So I come out. Again and again and again. My appearance can’t do the talking, but I sure as hell can (Georgopolus, 2013). This excerpt is from a recent blog titled Coming Out as Biracial, and I found myself reading it over and over again as if (another) light switch had been turned on regarding my own racial experience. As I reflected, coming out is a process that enters my life most every day and the same may be said for many others on your campus from Mixed Race Heritage. It happens the minute a student walks into a cultural center of her or his background and doesn’t quite have “the look.” It happens when an administrator or professor joins a campus race-based affinity group and doesn’t have a matching last name. It happens when someone is spoken to in a language they are assumed to speak because of their appearance or name. And depending on the moment, she or he may decide to come out or not. Either way, it takes energy and has an impact that is different from the monoracial experience. 1. Do your self- work! For those of Mixed Race: Continue to do your own healing and liberation work – dig deep, let yourself feel, connect with others, laugh, cry, be angry, be strong, be vulnerable, let yourself simply be. Oh, and let’s stop dividing ourselves into percentages and instead consider our wholeness within our multiracial/ethnic backgrounds. I often hear monoracial people say, “that happens to me too” (i.e., I too get called coconut or People also try to guess my racial background). I understand support is needed with those moments and please know the experience and impact are not the same. Schedule these types of events at varying times that allows students (and their families) enough time to attend all of them. The systemic structure that forces them to choose yet again needs to be transformed. Create a Loving Day or Loving Week – if you don’t know what this is please look it up. Incorporate Multiracial Identity into the monoracial celebratory week or month long events. I understand you may get frustrated or be uncomfortable, and you (and I) may step in it. With deep empathy I say oh well, get over yourself and do better. Be courageous, be open to messing up, be willing to push the envelope and be willing to step out of the box. I leave you with this Bill of Rights for People of Mixed Heritage written by Dr. Maria P.P. Root. For those that are monoracial, take time to understand why I included this in the blog. For those that are Bi/Multiracial, I hope you are able to find connection and it provides further strength when you are exhausted. Please remember we are ALWAYS enough. dr. becky martinez is a consultant with a focus on social justice, leadership and organizational change. She works with organizations to dismantle systems of oppression through critical dialogue and reflection intertwined with theoretical foundations. becky has worked as an administrator in various institutions of higher education prior to consulting. She is a faculty member for the Social Justice Training Institute and a Lead Facilitator for the LeaderShape Institute.